This week we joined Public Advocate, Colleen Pearce, at a Royal Commission into Family Violence hearing. The Commission heard from us about additional ways and the additional places that women with disabilities experience family violence, in our homes and in services. We shared some of the recommendations from our written submission. Our written witness statement highlighted how violence can be prevented through accessible housing, employment and leadership opportunities for women with disabilities. The Commissioners were interested in how the National Disability Insurance Scheme will prevent and respond to family violence. The hearing transcript and witness our statement will be available on the Royal Commission's website. In February 2016 the Commission will deliver it's report and recommendations. For more detailed news and updates on WDV's work on violence against women with disabilities, sign up to WDV's Violence Quarterly. 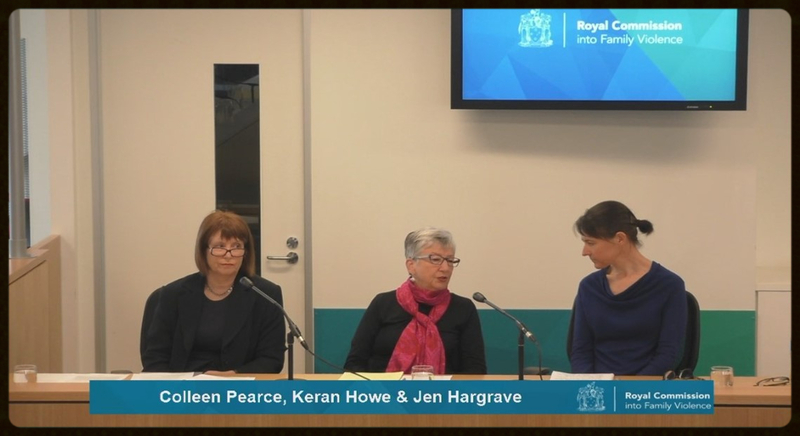 Screenshot from online streaming of the Royal Commission into Family Violence panel presentation with Public Advocate, Collen Pearce, Keran Howe and Jen Hargrave. Gratitude to Sarah from DVRCV for the screenshot. The film, 'IMPATIENT,' follows artist and activist Sue Armstrong’s efforts to make the Victorian mental health system safer for women. A philanthropic project is happening to get 'IMPATIENT' seen around Australia. You can donate to this important film through Documentary Australia. IMAGE: Sue Armstrong, advocate and artist. During Women’s Health Week 2015 (7-11 September), women across Australia will have the chance to discuss issues they might not usually discuss - online at or at public events in Sydney and Melbourne. Online this will include articles, videos, podcasts, recipes and tools supported by experts from Jean Hailes for Women’s Health. Each day will have a different theme based on survey results of what women want to talk about. Sign up - registration is free. The Human Rights Law Centre released a series of Fact Sheets. Topics include Women and Disability. These are a useful resource for anyone taking a human rights approach to Gender and / or Disability. The National Disability Recruitment Coordinator (NDRC) is holding its next free-of-charge Getting to Yes seminar in Melbourne on Tuesday 1 September. Employers will learn about the benefits of employing people with disability and good practice in doing so. The Australian Disability and Indigenous Peoples’ Education Fund is open for applications. People with disabilities of any age living in Australia may apply for help with formal and informal education. Application close on September 30 2015. Recent graduates of law, journalism, international relations, area studies, or other relevant disciplines are invited to apply for a Human Rights Fellowship. Applications close 8th October 2015. The Disability Discrimination Legal Service management committee is seeking a Treasurer on a voluntary basis. DDLS works with clients on issues of disability discrimination – most often in Education and Employment but also Goods and Services and other areas. To ensure the representation from people with disabilities is maintained the committee is particularly seeking a person with a disability who has financial skills (not necessarily an accountant) and is across issues of disability and interested in human rights. The committee meets every 2nd Wednesday of the month at 12:00 – 1.30pm at Ross House. Expressions of interest and enquiries should be directed to Julie Phillips. The Melbourne Social Equity Institute invites applications to present at their conference on the themes of 'Disability & Human rights' and 'Disability & Social equity.' Applications are due by the 2nd of October. Women have less super than men, live longer and take time out of paid work to care for others. The Women's Money Toolkit has tips and tools to help you manage your money. The Indian Film Festival of Melbourne opens this Friday, the 14th of August, at venues across Melbourne. The theme for 2015 is ‘Equality’, and the program explores gender, sexuality, ability and inclusivity within film. See the festival's access information.